Enclosed walkways over public sidewalks are generally a bad idea — removing pedestrians from the public realm. 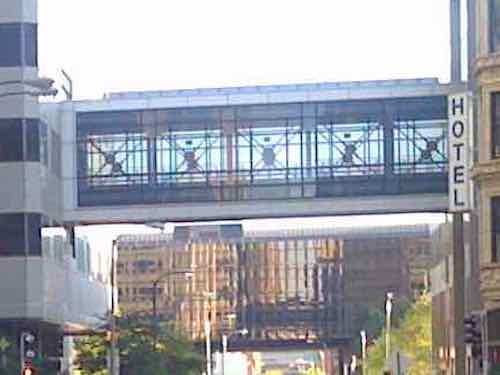 However, with these elevated walkways often comes the real culprits to killing sidewalk life: blank walls, inward focus, etc. 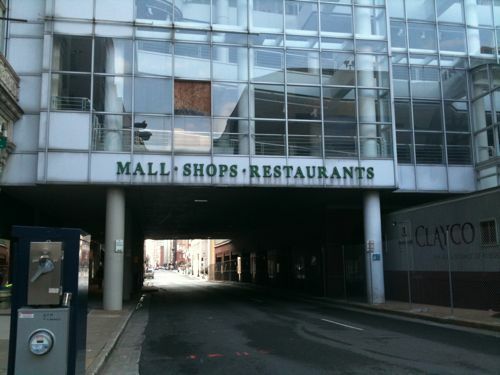 A prime example of what not to do in a downtown was downtown St. Louis’ St. Louis Centre indoor mall. 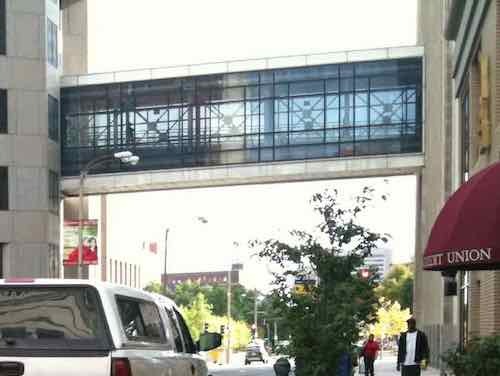 It was 8 years ago today that a big event was held to begin the removal of the very oppressive walkway from over Washington Ave — the first step in transforming the inward-focused mall into outward-facing MX retail with the interior becoming a parking garage. 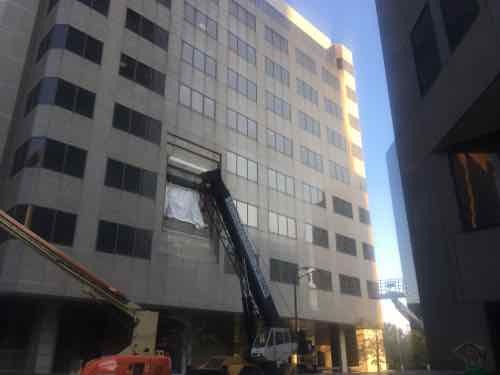 Two other walkways have been removed in the last year, one on each side of the former Southwestern Bell headquarters, later an AT&T building on Chestnut between 9th & 10th. The walkways connected the now vacant tower, now longer owned by AT&T with an older Bell building to the West and a 90s data center to the East. These walkways were very different than those at the former St. Louis Centre — up high, small, transparent, These allowed employees to walk to/from all 3 buildings without having to keep going through security. With AT&T’s significant reduction in the number of downtown employees the center towner became unnecessary. The tower’s new owners needed to reconfigure the tower from a single-occupany headquarters into a multi-tenant building. For them and AT&T that meant disconnecting the three buildings. 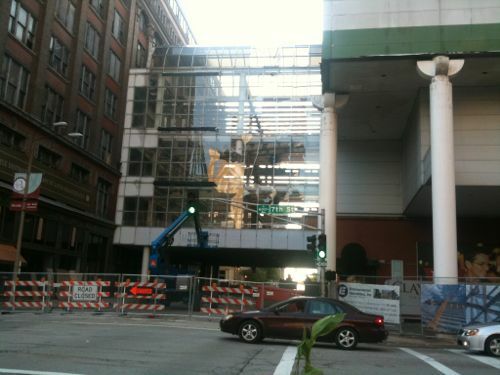 In SEptember 2017 the walkway over 9th was gone, though work remained to fill in the hole in the West side of the data center created by removing the walkway. The exteriors are all repaired now, though all three buildings are lifeless at the sidewalk level. This us by design. The removal of these two walkways won’t have the dramatic results we’ve seen at MX. 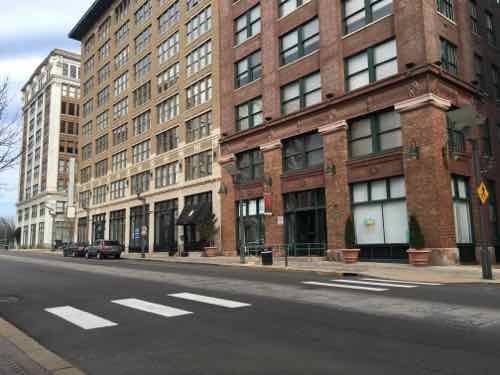 St. Louis has systematically killed street life block by block, neighborhoods by neighborhood. Attempting to bring back vibrant sidewalks for more than a few blocks here or there is likely a waste of time at this point. 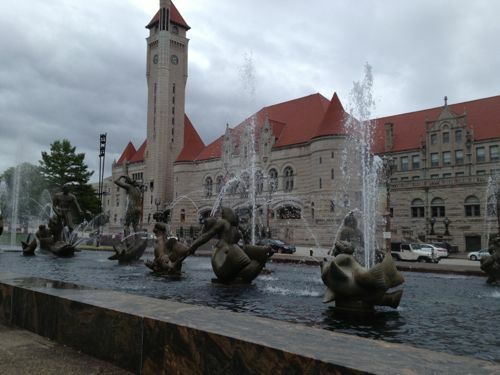 St. Louis has numerous places where, if you drive, you know the lanes shift left or right. 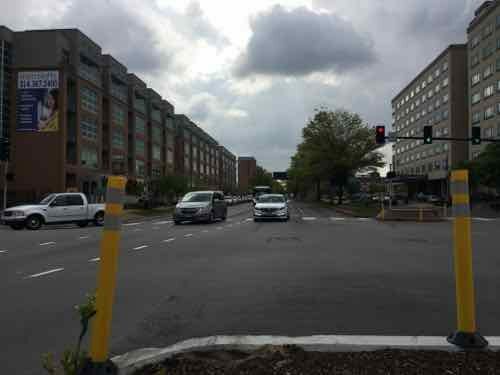 The recent work to raise Forest Park Parkway/Ave up to be an at-grade intersection with Kingshighway added two more: WB Forest Park Ave at Euclid Ave and SB Kingshighway at Forest Park. The other day I photographed the former. Looking East from the pedestrian refuge. 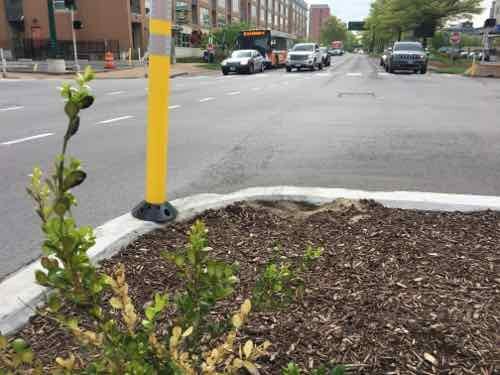 The planter protecting pedestrians has been hit numerous times, the yellow markers have been added to make them more visible. On numerous occasions I’ve been on the #10 MetroBus in the left-turn lane from SB Kingshighway onto EB Forest Park and I’ve seen cars in the center of the 3 SB Kingshighway lanes just continue straight — not shifting to the right. This puts them in the left most of 3 lanes. 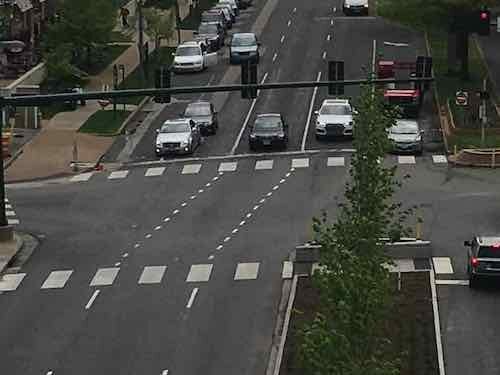 The problem occurs when a car is also in the left lane and shifts to the right to avoid hitting the pedestrian refuge planter — suddenly you have two vehicles wanting to occupy the same space. I’m rarely in either intersection as a motorist though I have driven both since the change was made. I have experienced our car nearly being hit in a similar situation on EB Chippewa at Meramec. When traveling EB on Chippewa you have two EB lanes until just past Morganford Rd when only the left lane continues EB and the right lane goes off right to Meramec St. Again, on numerous occasions I’ve seen vehicles in the right lane just continue straight ahead — nearly hitting our car at least once. When I’m driving I’m aware this intersection is poorly designed — so I anticipate other drivers might not be aware of what is expected. Back ar Forest Park and Kingshighway & Euclid the volume of cars is much higher. Both pedestrian refuge planters have been hit/damaged by vehicles. I suspect traffic accidents have been caused when a motorist doesn’t shift to the right — going straight ahead which means they’re changing lanes in the middle of an intersection. Most drivers who regularly travel these routes will learn/remember to shift. It only takes one driver not paying attention or visitor to cause an accident or hit the planter and damage their vehicle. How will future autonomous vehicles handle these shifts? We can and should do better in our street design! A couple of weeks from now will mark two years since my post titled: Deutsch Family Has Profited From Public Right-Of-Way For Nearly Two Decades. It was a more detailed follow up to an April 2009 post called Stealing a Sidewalk. In the late 1990s, Larry Deutsch was finally allowed to raze the historic 4-story building at 1101 Locust St. that housed Miss Hullings Cafeteria for decades. 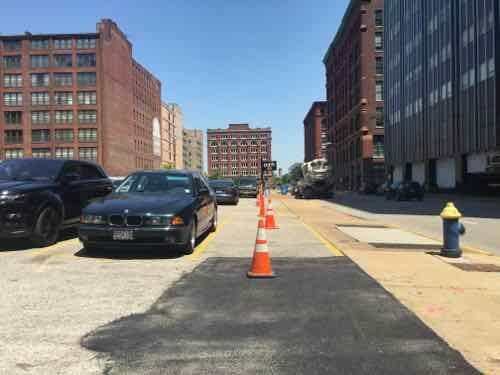 After the demolition crew left, new sidewalks were poured and the lot was covered in asphalt for surface parking. That’s when the line dividing private from public property was moved more than 3 feet. Legally the lot is 121 feet x 102 feet 6 inches. 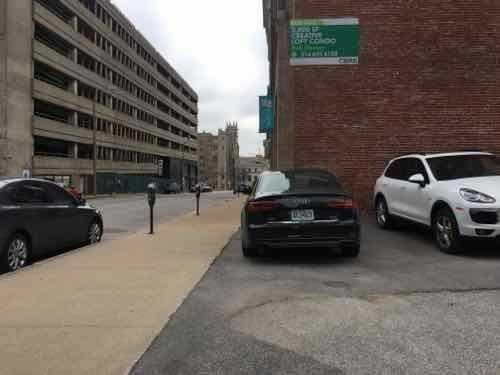 But by narrowing the public sidewalk, they made their lot 124.33′ x 105.83′ — a gain of 6%! 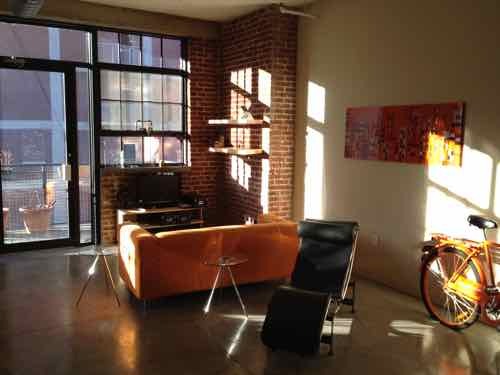 This is roughly 750 square feet of public space that has been used privately for years. This allowed them to have 5 additional parking spaces. The current daily rate is often $10, but let’s say $5/day. With about 300 revenue days a year, that’s $7,500 in additional revenue per year. Over 18 years the total estimate is $135,000. Serious money made by taking from the public right-of-way. After my May 2016 post they put orange cones in the parking spaces that were partially on public property. The building represents the property line, not the concrete sidewalk. Each time I’d go past the cones would be out — not as good as pouring new concrete sidewalks at the actual property line. But the other day I noticed they were back to stealing public right-of-way for their profits! And along 11th half of this vehicle is parked on the public right-of-way. Ownership hasn’t changed. 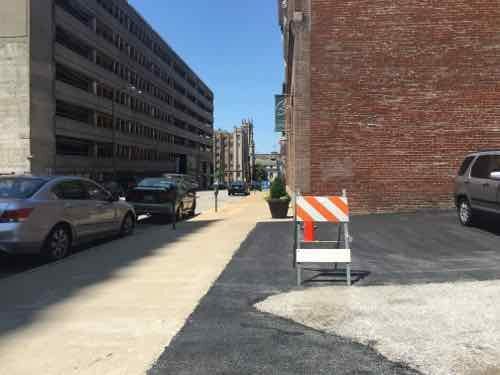 As I said two years ago, the city needs to force the Deutsch family to pour new concrete sidewalks that extend all the way to the property lin. 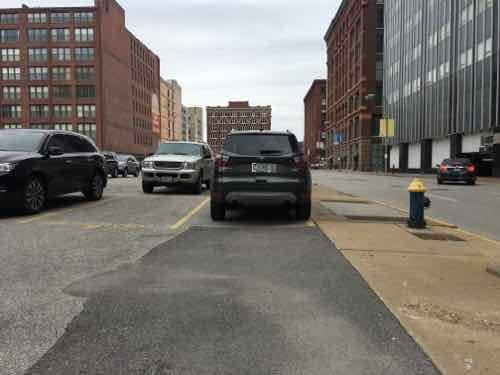 They also need to bring this surface lot up to current standards for surface lots — with physical barriers between sidewalk & parking so cars can’t park on or drive on public sidewalks. 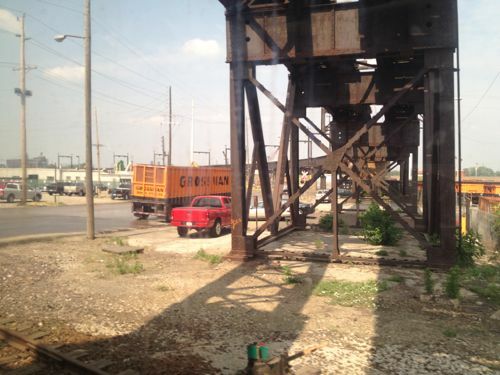 I’ll be reminding 7th Ward Alderman Jack Coatar about this today. 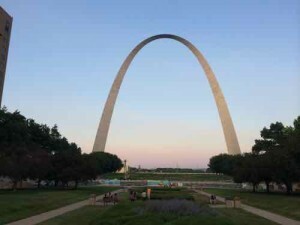 Fifty-five years ago today “the first stainless steel triangle that formed the first section of the arch was set in place on the south leg” of the Gateway Arch. Demolition of 40 blocks of old buildings and original street grid of the original village of St. Louis had begun nearly a quarter century earlier — in 1939. The idea of completely erasing the riverfront and starting over began following the 1904 World’s Fair. On April 11, 1934, lawyers filed incorporation papers for the new Jefferson National Expansion Memorial Association. Its charge was to develop “a suitable and permanent public memorial” to President Thomas Jefferson along the city’s dingy riverfront. Luther Ely Smith (June 11, 1873 – April 2, 1951) didn’t live long enough to see the Arch even started, though he knew which design had been selected from the competition. Not surprising St. Louis continues to honor people like Smith, someone who created a massive hole in the center of the city for decades. As chair of the City Planning Commission he hired Harland Bartholomew, who also pushed for massive destruction of the city & street grid — widening the remaining streets and opposing new rail transit. See Harland Bartholomew negatively impacted many cities.